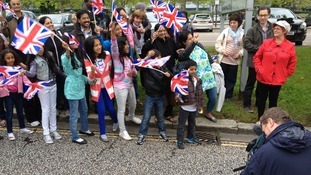 Hundreds of people celebrated the arrival of the Paralympic torch to Basildon over the weekend. The crowds were entertained by live music and stalls as well as a light show and various urban acts at the Wat Tyler Country Park. The festival was organised to celebrate the start of the Paralympic Games which begin on Wednesday. The final day of the flame in our region began in Luton, taking in Dunstable, Milton Keynes and Bletchley, before heading off on its winding route to London, 18 days from now. Day 51 of the Olympic torch relay, and we want to see your pictures! Email them to angliatonight@itv.com and they could appear here. Formula One driver Lewis Hamilton has carried the Olympic flame as it passed through Luton this morning. He was initially asked to carry the torch in his home town of Stevenage yesterday - but he was busy competing in the British Grand Prix at Silverstone. Formula One driver Lewis Hamilton carried the Olympic Flame as it passed through Luton on Day 52 of the Relay. 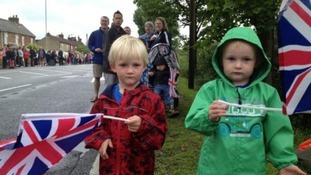 The Olympic Torch made its way through Bedfordshire, including the usually quiet village of Cotton End.